And she added: "It was hard to make out it was him. His face was swelling a little bit like a balloon." She told the court she was able to call for help from police when their van pulled up at the nearby junction. "At that point, Ollie [Mr Wilkinson] screamed at me from across the forecourt 'no police don't you dare'," she said. Miss Penfold said she swore at Mr Wilkinson. She said Mr Wilkinson later told her he respected her because she hadn't spoken to police, but she told him she had "zero respect" for him and "zero intention of keeping my mouth shut". Miss Penfold told the court Mr Wilkinson later told her if she talked to police she and her children would be next. But Mr Wilkinson's defence barrister Andrew Selby suggested she misheard what his client had said. 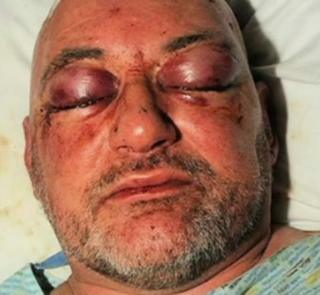 Jurors heard Mr Harrison's sight was badly affected in the attack. Mr Harrison has claimed Mr Barnes, 48, of Victoria Avenue, head-butted him and Mr Wilkinson, 50, of Duke Road, punched him. Defending Mr Barnes, Paul Evans said to Mr Harrison: "You did pick out Matthew Barnes when police conducted an identity procedure, but I suggest to you that Matthew Barnes was not the man who head-butted you." Mr Harrison replied: "He was the man who head-butted me." Mr Selby asked Mr Harrison: "You didn't see where this blow, this punch, came from did you?" "No" Mr Harrison replied, "But I certainly felt it." Mr Harrison went on to say Mr Wilkinson had been to his left and it was from there the punch came from.